Today I am not going to talk about any development I am doing or anything related to my activities. I am going to switch to my philosophical side because I really think We, as programmers, usually code things only because We could or We must to and We really need start to think seriously about “what we should do”. Here in Spain, my country of origin, A yet another outrageous corruption scandal has emerged this week. A brief description of that scandal would be: More than eighty top directives of a bank entity (bailed out by the government later) besides their amazing salaries, received a near magical credit card called humorously black card which gave them an undeclared to the tax office sum of money ready to use at their will. Of course, following our outstanding picaresque tradition most of them spent their money in things like lingerie, therapeutical asian massages, unspecified night clubs with unspecified reputation and so on. Obviously their IT systems were prepared to diligently to deal carefully with the narrow range of credit cards numbers owned by these guys. And that’s what involves us here. Somebody (and I can imagine perfectly a young suited corporate guy with a poor salary) coded that system probably without even wondered himself what he was coding. Those guys are not, by any mean, responsible of this scandal but It is a good example of how we can affect the world with our code. We code complex derivative trading orders, though by really smart mathematicians which barely understand them and They convert them to recipes for people who doesn’t understand them at all. We entirely coded the subprime crisis and only god knows what kind of disaster We are coding now. In the end this is a matter of coherence, coherence is a lost virtue in the 2.0 world. It is necessary for us to keep a minimum of coherence with our values. It is not the easiest path, it is the best path in the long term. And of course We shouldn’t forget our code affects people out there. During my struggles with Bluetooth Low Energy (I have to write a burst of serious posts about this technology still in its infancy of opportunities but pretty promising) I had to deal with Bluetooth low energy modules and dongles made by Bluegiga. Bluegiga has made them pretty easy to use and it is possible to program them as a standalone bluetooth unit totally independent of where it is connected. The problem arrives when you want to use this technology with Android devices. Android Bluetooth low energy support is relatively new (4.3) but there are a few capable devices of handling this connections. Most of them at this moment qualify as High-End Android phones or tablets. There is another problem, Bluetooh low energy is a modern cool saving battery piece of engineering but It is not a best bluetooth. A simple example, if you want to stream data Do not use it, or use it at your own. In Android is worse, I compared data rate of Bluegiga modules and Android nexus 7 tablet and data rate was better in Bluegiga dongles. (I guess that is the prize of being far to the metal). So I needed to connect my BLED112 Bluegiga dongles to Android as a Serial port devices, in order to do that I coded a little library to do it. I added support to CP210x USB to UART device. More devices must be added and some improves too, but I think it is not a bad piece of code and can get the job done. If you want to use it, just download the jar file from and added it to libs folder in your android project. Follow instructions to use it. If you want to add something just let me know. Final device classes still shared code that could be moved to base class so I would rather refactor the code before adding new features. I am going to start my new blog writing about things I have been working last month. In September I started to work in a very interesting project which one of its future branch involves natural interaction devices. This project uses Android as a main platform over other mobiles OS due to obvious reasons. Because this branch of the project nearly started when I was contacted, I was suggested to use an Android port able to run in X86 computer. At first I was like: Ok I get it, We mount an Android -X86 ISO using VirtualBox, VmWare or whatever and we will be able to use this curious thing. But soon I realized I would have to go deeper into OpenNI source code and PrimeSense sensor drivers. I must admit sometimes It was a real pain but at the end I finally achieved and it was rewarding. So I would like to share with you to save you pain and time. Set CONFIG_USB_DEVICEFS and CONFIG_USB_DEVICE_CLASS to yes. This line is what you are going to find all over the internet if you are trying to mount USBFS and usually It should be ok BUT, and I remark BUT due to Android applications run in a kind of sandbox, very pretty but walled to Linux resources too you are going to suffer if you want to run Android apps developed with standard SDK (You can still run C++ example apps provided with OpenNI but I know you want to see Depth or IR pretty images, no a simple command line application measuring fps). Now You should be ready to build Android-X86, just follow instructions provided in the official website. They are pretty straightforward. # optionally add NEON to compilation flags. # to activate, run: "ndk-build USE_NEON=1"
Now the necessary modifications are done it is possible to build OpenNI and PrimeSense drivers to Android x86. As I said before, just follow the instructions of Hirotaka Niisato and everything should be ok. Now the build is ready we have some binary files that need to be moved to our Android system. Hirotaka did a good tutorial about creating a simple android app with OpenNI but the structure of the project is quite a mess in my humble opinion so I tried to simplify it. 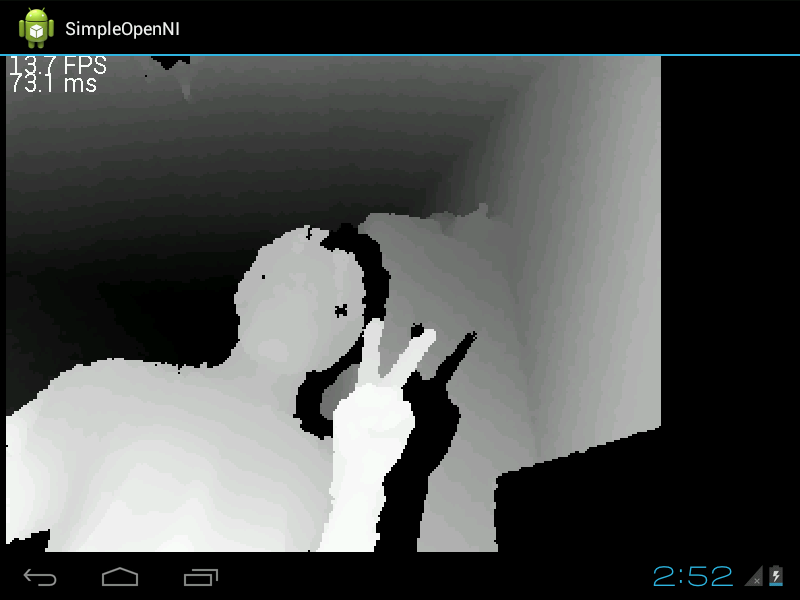 I also added some methods to get IR and RGB through classes provided in that simple demo. I will write another post about it. Feel free to ask any doubt you have. OpenNI can be very tricky sometimes.